The studentship offers a unique training experience in the field of DIS. 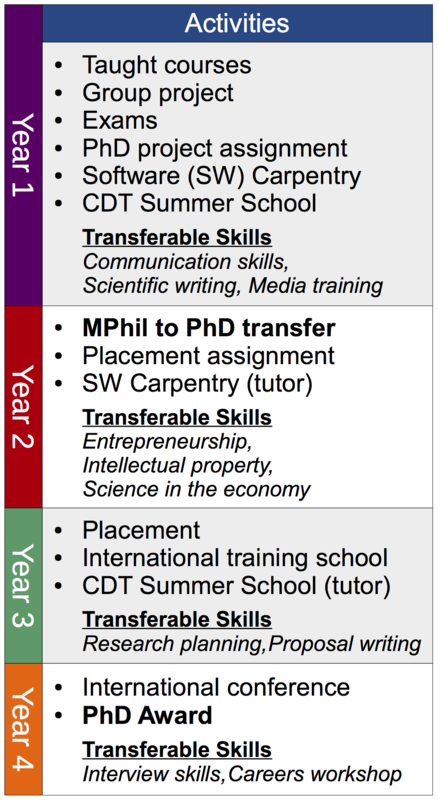 In the 1st year of the PhD a series of intensive courses, designed with the aid of our partner organisations, will provide a strong theoretical and practical grounding in the techniques, tools and programming languages of DIS, that are commonly used in both academia and industry. This will be followed by undertaking a research project on one of the world leading DIS facilities which STFC contributes towards, such as ATLAS at the Large Hadron Collider, Planck, Gaia, DES, DESI, Euclid, the Square Kilometre Array and LSST, amongst others, which as well as carrying out ground-breaking research, are also ideally training grounds for DIS techniques. The studentships will also involve a 3-6 month secondment at one of UCL's DIS partner organisations, who are either power users or world leaders in DIS techniques, such as the BBC, The Economist, The MET Office, CERN openlab, NCC Group, Starcount, Lenovo and Mellanox amongst others. Training will be supplemented by regular summer schools and networking events, involving key industrial and academic figures. The CDT students will develop a unique skillset covering DIS in both academia and industry, will form key contacts and networks in both areas, will work with cutting edge technologies and will be equipped to become world-leading data scientists.